VFW Post 4464 Commander Bill Mangus steps between the Post Honor Guard with a wreath. On March 29, 2012, then President Barack Obama declared the day as Vietnam Veterans Day. On March 28, last year, President Donald Trump signed the Vietnam War Veterans Recognition Act of 2017 which officially recognized National Vietnam War Veterans Day as March 29. 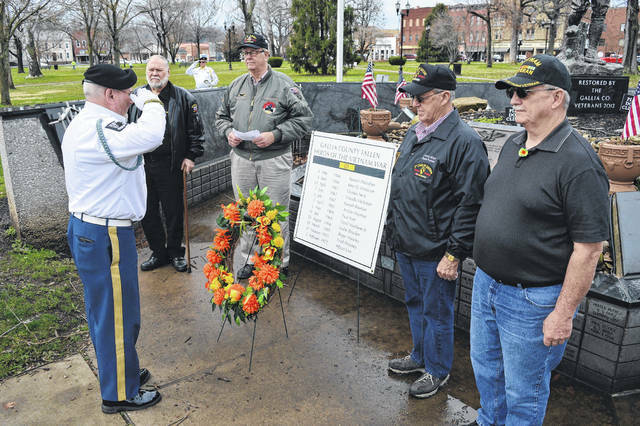 GALLIPOLIS — While the Vietnam War may forever be remembered as a controversial point in American history, Gallia’s Vietnam veterans remembered it Thursday as a time of sacrifice and duty. Veterans and community members honored the 12 names of Gallia veterans, among the nation’s tens of thousands, who died during the war at 1 p.m. in Gallipolis City Park in front of the Spirit of the Doughboy memorial. Mangus said the day was set March 29 because in 1973 the last US forces left Vietnam. VVA member Gary Fenderbosch led the ceremony’s closing prayer. A firing salute was held afterwards. Vietnam Veterans of America members lead a memorial to recognize National Vietnam War Veterans Day in Gallipolis City Park. From left to right stand Bill Mangus, Ron Wroblewski, Gary Fenderbosch, Larry Marr and Mike Plymale.